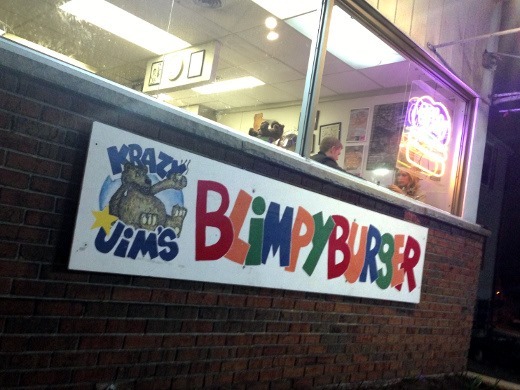 …and after being closed for business for 13 months, Krazy Jim’s Blimpy Burger has finally reopened in their new location at 304 S. Ashley in downtown Ann Arbor. 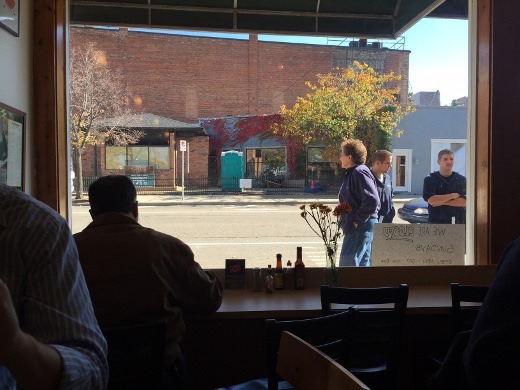 When I visited with my officemates last Thursday at 11:30 AM, the line was TO the door, but not OUT the door. Though I’ve seen plenty of pictures on social media of the line OUT the door and down the block since Blimpy reopened earlier this month. 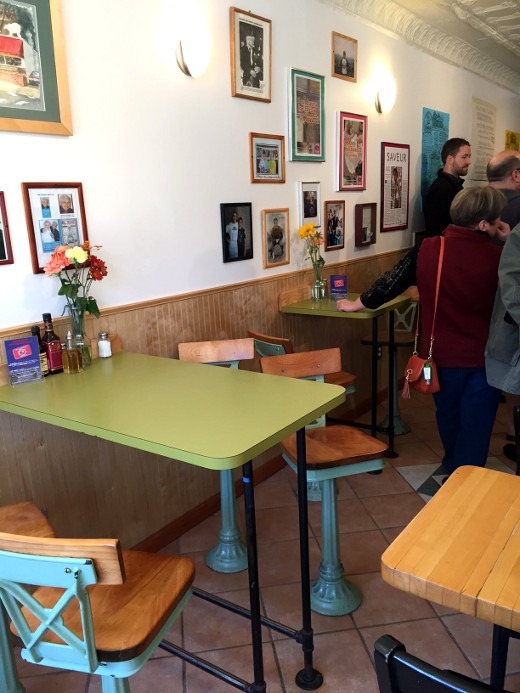 Blimpy has retained much of their charming original furniture, as well as added some additional seating at their new location. Despite the line to the door, our large party had no trouble securing a couple big tables beside each other at lunch. 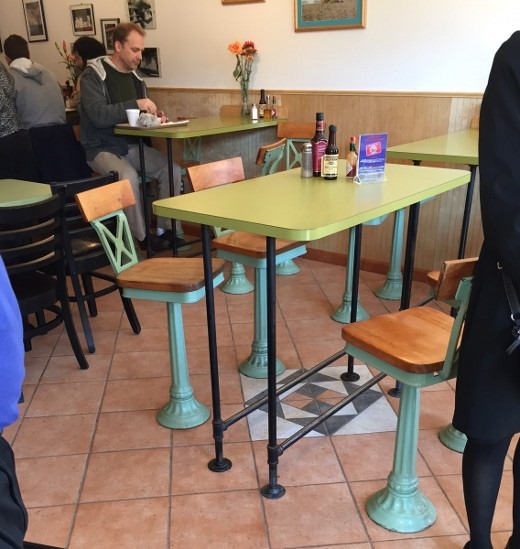 The extra seating is a great addition. I also appreciate the fact that the Blimpy folks saved and brought over all sorts of eccentric picture frames filled with weird art and random articles that were originally displayed in their former location. 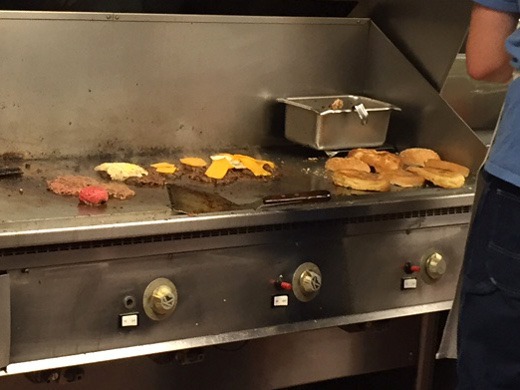 Most importantly, the ordering process is still the same. You MUST follow the rules when order! Do NOT indicate what type of cheese you want UNTIL YOU ARE ASKED! Rule breakers will be reprimanded. Also important is the food. Tastes just like the good ol’ Blimpy I remembered. Note to self: onion buns really necessitate a quad, not a triple. Next time. And yes, a quad is FOUR beef patties for you Blimpy virgins. 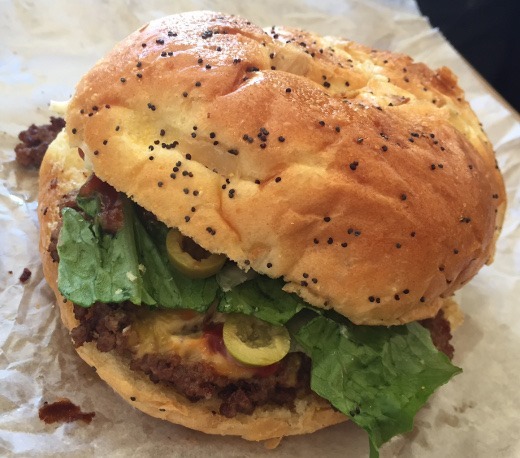 And yes, that is actually a pretty reasonably sized burger at Blimpy. Totally non-crazy. But oh man, you know what was even better than I remembered? 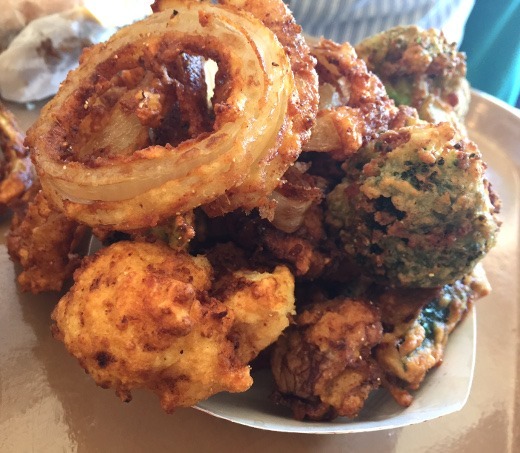 The deep fried mixed veggies. Holy deliciousness. That broccoli though. The batter is not super thick, so I still feel like I am getting a decent serving of veggie, and the coating is also crisp, and not overly greasy. DANG. Another improvement: it’s so much easier to refill your soda without cutting into the line at the new location. The consensus of my co-workers and I really seemed to be that Blimpy has retained all of its “quint-essential” features (indulgent, greasy comfort food; strict adherence to rules; quirky décor) all while offering some new improvements (accepting credit cards; more seating; easier to navigate interior). Pretty much the perfect balance of old and new. I still have yet to hit the new location. I’m guessing parking stinks? U always found a spot in Division close to the old one. Look at me, complaining about parking like a true Ann Arborite. The street level lot at the corner of William and Ashley often has spots and directly is across the street from Blimpy so that is a good bet, but yes, it was easier finding spots on Division at the old one. Parking is horrible. Been twice and the line does not move that fast like it used too. I hope they get back into the swing of things. We easily got a spot across the street in the William and Ashley lot but I know that is not always the case. Oh the joys of parking in Ann Arbor. I agree that the line a pain – hopefully once the hype wears off the line will become more manageable. For those who complain about the long lines after the re-opening, look at it this way… It cost the Magners quite a bit in time, money, lost business and experienced employees. 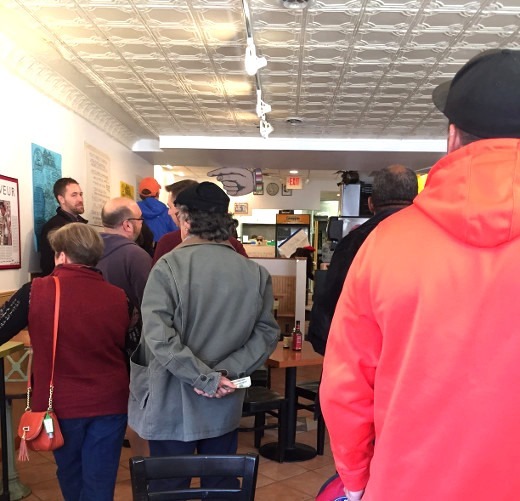 If the line is too long, be patient and grateful that KJ’s is successful and still here. Agreed – this is true!